The cast of a Broadway show involved in a long-run hit is called together on a routine basis, perhaps twice a month or more, to walk through the script repeating their lines and discussing issues that might have arisen since the last review. One might ask why, after performing so many shows over the course of weeks, would they need to go over the script in a rehearsal mode. The answer is rather simple. Over time, words in a script get dropped or modified and over time, a sentence may take on a meaning that was not intended by the author. This type of review is not unusual, but standard operating procedure. What does this have to do with pickleball? I think the answer is relatively simple. From what I have read and witnessed, most pickleballers are not tournament players. They like recreational pickleball and enjoy the fun and benefits of social, competition and exercise. When we learn to play pickleball, many of us are taught certain skills such as the proper dink technique and unless you are a serious competitive or tournament player, the odds are you don’t “practice” much and that’s OK. Many of us just enjoy playing and don’t enjoy (or desire to) practice. Although I prefer to play more than practice, I am interested in improving and doing better and therein lies the rub. Every once in a while, I like to review how to execute certain skills such as dinking, the overhead smash, serving, etc. That doesn’t mean I am going to spend hours practicing. What it does mean is that I will pay more attention to how I execute certain shots and focus on proper technique when I do play. Hopefully I will pick up a tip or two (or just a reminder) that will help me improve my current skill set so that I can perform better. With that in mind, I am including two videos for those who want a refresher on dinking skills. This is an important, yet often overlooked part of the game that tends to favor the more dramatic power shot. When you are at the net and receive a low ball, you must be careful not to pop up something high and attackable. A dink (yes, that’s what it is called) is a great response to a low ball since it makes it hard for the other team to pounce. In this video from Third Shot Sports, coach Mark Renneson breaks down some key elements to a great dink. Jordan Briones of Primetime Pickleball explains some of the more modern strategies behind the dinking game. Learn what a dead dink is and how to avoid them. I hope you have found this review useful and that it helps you enjoy your play even more! 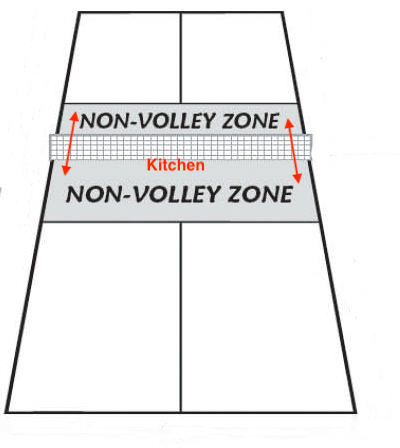 After a pickleballer plays their first several games, they soon understand that the Non-Volley Zone (see diagram below) is often referred to as the Kitchen. Picture Courtesy of School Specialty – Modified for this post. 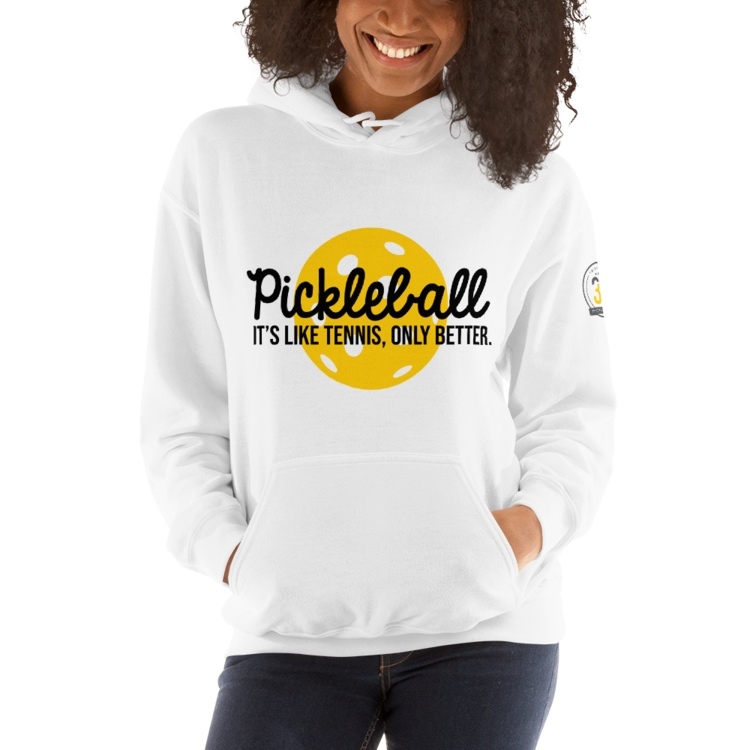 It is interesting to me that I will often be approached by a pickleballer who asks me: “Do I have to wait until the ball bounces to go into the kitchen?” or “When can I go into the kitchen?” At times, these are people who have been playing for years. Somehow a number of players are under the impression that it is a fault just to step into the kitchen; anytime. As always, let’s check to see what the rulebook tells us about this situation. 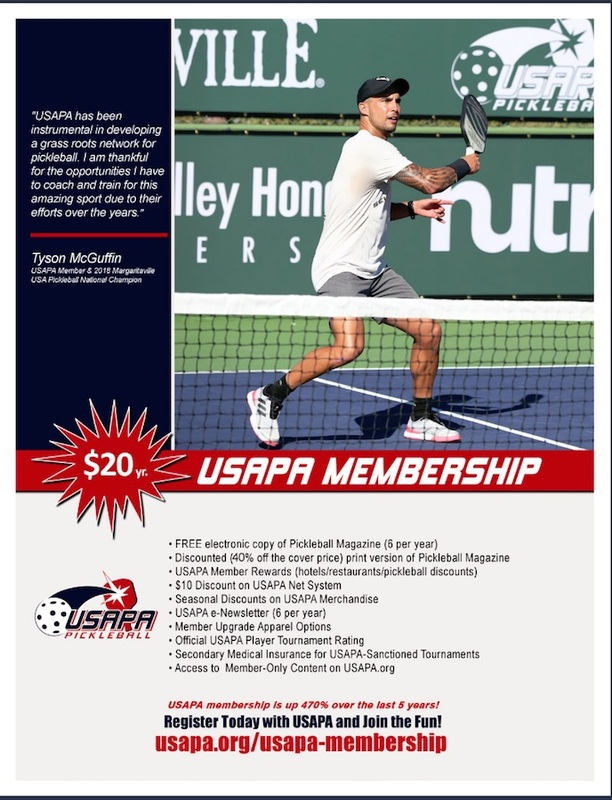 SECTION 9 of the 2019 USAPA & IFP Official Tournament Rulebook (pp. 36-37) goes into detail about the non-volley zone rules. It seems to me there are four important subsections regarding this discussion. 9.A. All volleys must be initiated outside of the non-volley zone. It is a fault if a person volleys the ball (hits it in the air. i.e without a bounce) while standing inside the NVZ. NOTE: It would also be a fault if a player volleys a ball and their foot is touching any part of the NVZ line even if the rest of their body is not in the kitchen. 9.E. A player may enter the non-volley zone at any time except when that player is volleying the ball. It is not a fault to enter the NVZ at any time as long as that player does not volley the ball. A player can remain the NVZ the entire game if they wish. Of course this is not a good strategy and would be a rather absurd behavior, but there is no rule against it. 9.F. A player may enter the non-volley zone before or after returning any ball that bounces. A pickleballer is allowed to enter the NVZ to return a ball that bounces. They may enter either before or after the ball bounces to return a ball that has bounced in the NVZ. 9.G. A player may stay inside the non-volley zone to return a ball that has bounced. There is no violation if a player does not exit the non-volley zone after hitting a ball that bounces. A player may remain inside the NVZ after a bounced ball is returned. They do not have to exit the NVZ at any specified time interval. Most accomplished players remain very close to, but not in, the NVZ during much of the game. If a ball falls into the NVZ and bounces, they quickly go after the ball, return it and then step back out of the NVZ. This enables the player to volley a ball that comes their way because they have vacated the NVZ. I would be remiss if I didn’t point out another important, and often misunderstood nuance about the NVZ highlighted below in section 9C. 9. C. – It is a fault if the player’s momentum causes the player to contact anything that is touching the non-volley zone, including the player’s partner. 9.C.1. It is a fault even if the ball is declared dead before the player contacts the non-volley zone. A player’s momentum cannot carry them into the NVZ after a volley or it is a fault. Even if the ball is dead at the time, their momentum cannot cause them to step into the NVZ after a volley. A player may not touch their paddle down in the NVZ or drop anything into the NVZ or that too is a fault if it is done in the act of volleying. NOTE – These are not the ONLY rules regarding the NVZ. I only selected those sections that help to answer the underlying basic question of when a player can enter the NVZ without creating a fault. I believe any serious pickleball player can learn quite a bit by reading the USAPA & IFP Official Tournament Rulebook. You can order your copy HERE! You can also download a free PDF HERE. If you have questions, leave them in the comment section and I will do my best to answer them. I just want to touch base with those on the email list about a few items. Normal schedule will resume on Tuesday, 1/22! Larry Lite, USAPA Southwest Regional Director, will be meeting with the North Central Arizona Ambassadors on February 1, 2019, to provide an update on the various programs being offered by the USAPA. He will go over his goals for the region, an update on the Ambassador program and a discussion about issues and concerns amongst our ambassadors. There will be opportunities for ambassadors to share their questions and ideas as well. I will keep you posted regarding pertinent information! Over the last several weeks I have heard some players make line calls by saying: “I think the ball was out!” We can probably all agree that on some courts the lines are difficult to read and calling balls correctly may be a bit tricky at times, but let’s examine the sentence above. So, you think you have had some long rallies? 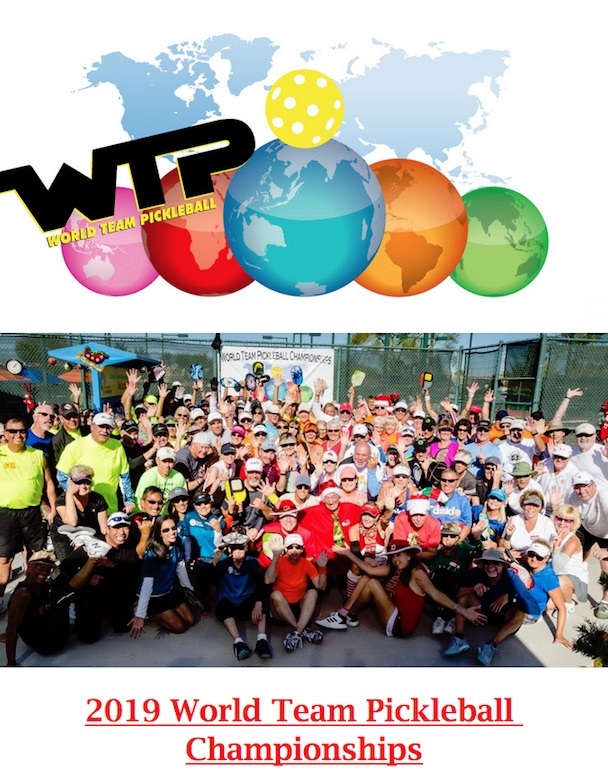 How about a 68 shot rally at the Las Vegas Pickleball Open. NOTE – I have introduced Jim Baker’s excellent videos in a number of my blog posts and this one is especially for average plus players because you need a good level of at-the-net skills such as dinking and volleying. There are, however, some hints for players at every level. The term “fast game” is used in this video to denote a rally at the net that involves a quick interchange of volleys at the net which shortly results in one team winning the point. The above statement is especially true if you “poach” a shot and step into your partner’s zone leaving a big gap. If your shot does not win outright, you are most likely to leave a wide gap in the area you left to attempt that poach and your team will most likely lose the point. If you are going to poach, be sure (or at least mostly sure) that you are going to hit a winner. If you are a 3.0 or higher rated player, this video might be of interest to you. Another thing Jim suggests in his video is that the best players are apt to lose these fast rallies about 30% of the time. To use a baseball analogy, you would still be batting .700 So don’t be discouraged to try to implement these strategies if you have the skills! If you would like to see how a pickleball tournament is conducted or just have fun watching the competition, here is your chance. The following message was sent by Steve Manolis via the Phoenix Area Pickleball mailing list. This Thursday through Saturday come on out to Pecos Park as we start our first full scale local tournament. All levels are signed up to play. We will have a food truck, vendors, raffle items and practice courts open. We are also accepting paddle donations for schools and students. Sunday, December 9th is kids day, we will have prizes, coaching, contest and games for kids and adults…free to attend, no registration to play on Sunday. Try paddles from various vendors. All registration fees and donations go back to the schools and community. Pecos Park is located at 17010 S 48th Street, just west of I-10 and south of Chandler Blvd. The indoor pickleball venues are crowded this time of the year. One way to avoid long waiting times between games is to arrive a bit later during the scheduled day. I understand that this is not possible for everyone, but you may have noticed that towards the end of the session, the crowds thin out. Last week a group was playing almost nonstop during the last hour at one of the community centers. What does it take to move from being an intermediate player to an advanced one? Well, there isn’t a magic bullet but there are a few things that I’ve noticed have made the difference. Here’s a short list of what I think separates the two levels. Be More Consistent. Higher level players don’t really hit fundamentally different shots than their less-skilled counterparts. But what they do is hit quality shots more often. While a 3.5 might be able to hit a deep return 5 out of ten times, the 4.0 can do it 7. The difference is often not much more than having a clear intention. On a related note, if you miss many “easy balls” you’re going to have a tough time advancing a level. Standard volleys, dinks, serves and returns should be near 100% success. Missing them should be a surprise. Finish Points. Strong players are good at ending points when they have the chance. Whether it is identifying angles, finding a gap or using speed effectively, strong players capitalize on opportunities. Have a Plan. Intermediate players often look (and feel) like they are just ‘trying to survive’ on the court. Advanced players have clear plans. When you are under fire pinned at the baseline, for example, a good plan would be to calmly play a drop that forces an upward hit from the other team. 4.0s try to do this. Most 3.5s just hit the ball back hard (or lob). When I teach pickleball to beginners, I emphasize the ideal groundstroke position, i.e. 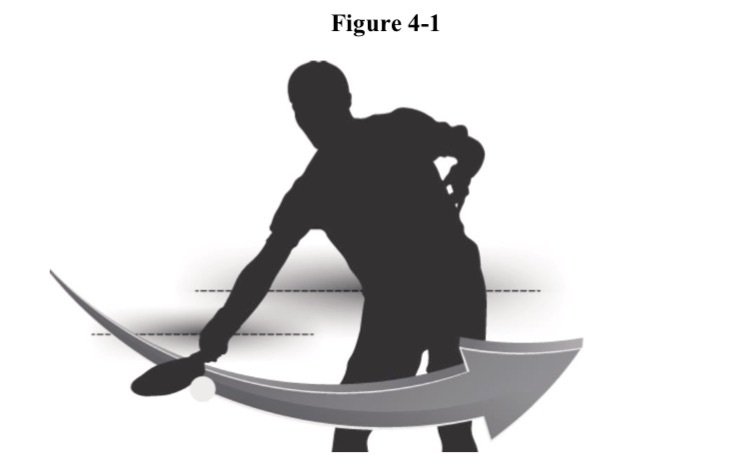 shoulders perpendicular to the net when possible. Of course if you are running hither and yon trying to get to an angled shot, etc. all bets are off. Here is a video explaining a technique for the groundstroke. Mary Travis, USAPA Ambassador at Large, suggested that the “old” or previous newsletters be made available in some form now that they are web-based so that they can be reviewed in the future for pertinent content.